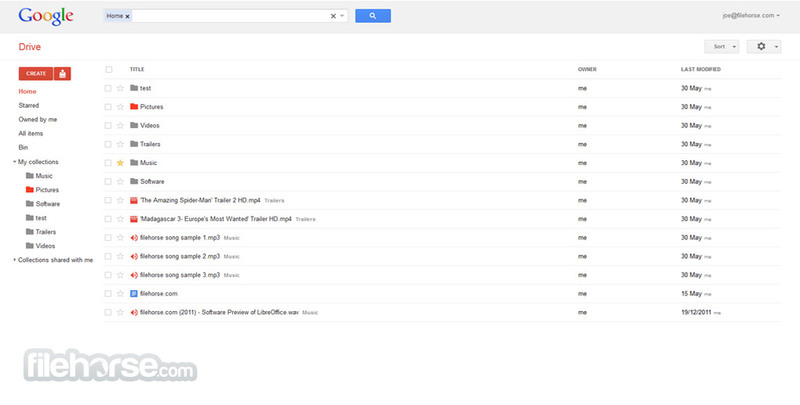 Google Drive represents one of the best examples of cloud storage solutions that you can find on the internet today. Not only that it allows extremely easy and intuitive ways of uploading your files to the cloud where they will be stored in an extremely secure environment, but also it provides unprecedented connectivity options that can make your vacation images instantly available to friends, and projects project instantly accessible to your co-workers, colleagues or clients. This means that Google Drive can help you with your school projects, serious scientific projects, and can become your online storage space that will hold your most precious files that you can’t allow to loose. Store everything safely and access it anywhere! Try out Google Drive now and witness yourself the variety of powerful features that will make your life much easier and your files safer. One of the most popular cloud-powered applications from Google is their take on the problem of online haring, storing, creating and managing of files. With Google Drive that was officially released to the public not that long ago (April 2012, originally conceived in 2006), they have managed to instantly increase productivity of users that are already invested in the ecosystem of Google devices, enabled rock-solid protection of files on encrypted servers, and with minimum of changes to their old usability or visual formula of their celebrated suite of Google Docs webapps, enabled countless Google users to collaborate easily and efficiently. With support to Microsoft Windows, Mac OS X and Android systems. 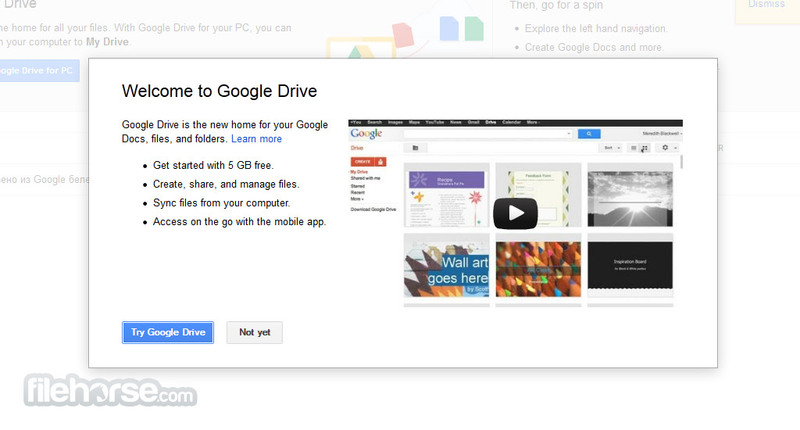 Google Drive represents one of the best online backup services and collaboration tools that you can find today. All that you need to try it out is Google account, and chances are good that you already have one already! Since 2012, Google Drive became integrated part of Google Docs, online suite of web applications for creating, editing and collaboration. This very nicely web application currently offers 5 GB of free storage space to every user , and its paying subscriptions are much more generous with storage space than can be found with competitions (most notably Dropbox which offers 2GB of free space and more expensive subscription tiers). Use of Google Drive is completely integrated into the rest of Google ecosystem, enabling you to edit documents on the fly, alone or with friends of colleagues. Files from your PC can be uploaded to the cloud either via integrated upload tool, or just by dragging and dropping files directly onto your internet browser. Free registration is a basis of all Google products, and Google Drive does not differ from that. Automatic 5 GB storage space is assigned to everyone who owns Google account, including hundreds of millins of people who have created that account over past years just to access some Google offering (Gmail, YouTube, etc.). If 5 GB of free storage space is not enough for your needs, you can pay for a very affordable monthly subscription plan that gives you 25GB of online space for only $2.5. Using Google Drive is an effortless experience that will be greatly appreciated by all the old users of Google services, especially those who have already fully invested into Google Docs ecosystem of excellent productivity apps. As for new users, they are more than welcomed to try this great service that will most likely become their go-to place for storing all their important documents and projects. Get 5 GB for free! Get started with 5 GB of free space. Upgrade to 25 GB for less than $2.50 a month, and you can store practically everything for next to nothing. Google Drive lets you do more than just store your files. Share files with exactly who you want and edit them together, from any device. Google Drive gives you instant access to Google Docs, a suite of editing tools that makes working together better—even when your teammates are miles away. Google Drive is everywhere you are—on the web, in your home, at the office and on the go. So wherever you are, your stuff is just...there. Ready to go, ready to share. Get started with 5 GB free. 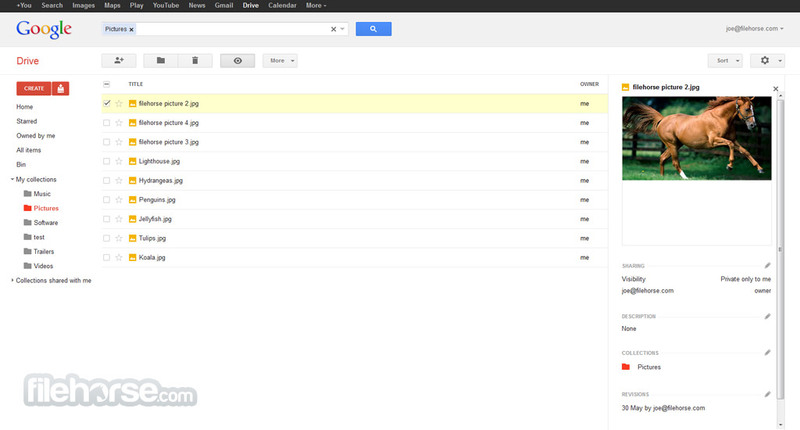 Google Drive is available for PC and Mac, Chrome OS, iPhone, iPad and Android devices.